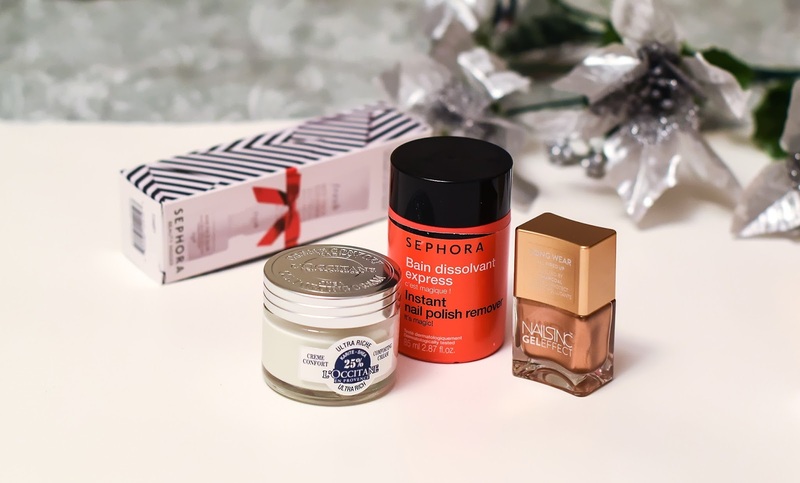 Today I want to you show you a few beauty products that I actually bought during Black Friday sale at Sephora and I was going to publish this post that time, but I didn't get a chance to do it until now. So, now about my purchases: after happily finished my Estee Lauder "Hydrationist" Maximum Moisture Cream*, it was time for me to try something new, and since I have dry skin that gets even drier in colder months, I always need extra moisture this time of a year and I decided to buy L'occitane Shea Ultra Rich Comforting cream for Dry to Very Dry skin*. Nails Inc nail polish in Crown Place. I have never tried any nail polish from this brand, the only reason I decided to buy was its gorgeous golden shade. Unfortunately, it didn't work as well as I expected __ the color is absolutely gorgeous, but it's not a good quality nail polish, it leaves some lines on my nails, and chips after 2 days. As you can guess, I will never buy it again. Sephora Instant Nail Polish Remover __ I wanted to check out something new, so since this nail polish remover was available in travel size I decided to give it a try. When I purchased, I actually didn't realise that it was not a regular nail polish remover __ inside the bottle, there is pre-moistened pleated foam, you basically dip your nail there, twist twice and all the nail polish comes off. It really does a good job, but the problem is that I still need a regular nail polish remover if I have to clean around my nails any mess after applying my nail polish. 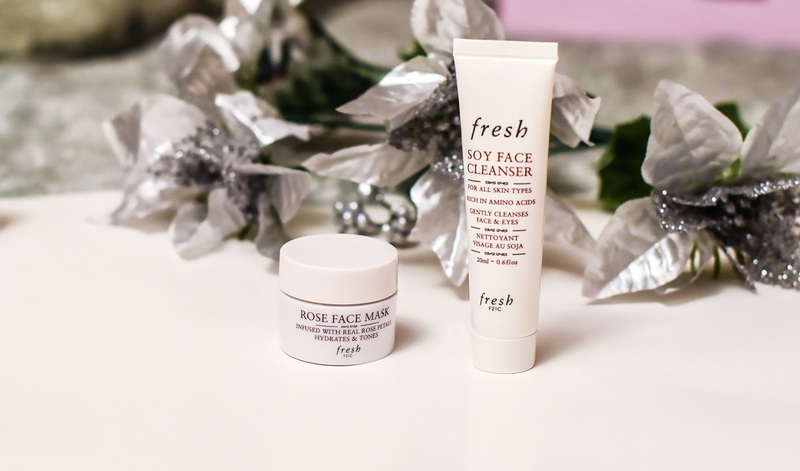 This Fresh skincare set that includes Soy Face Cleanser and Rose Face Mask, I got as a Birthday Gift from Sephora that was a very pleasant surprise. The reviews are coming on the blog soon. So I'm not going to talk about them here. I also got Klorane Blonde Highlights Conditioner, Hourglass Veil Mineral Primer, and Sephora liquid foundations in three different shades that I haven't used yet. P.S. Last few weeks have been really hectic to me. When my 5 years old daughter went to kindergarten this year, I thought, my life would to be much easier, I would have more time for blogging and simply, for myself, but I was so wrong!!! __ Since she started to go to school I rarely have time for anything because not only she is in the middle of starting reading, learning mathematics, but also in the middle of adjusting to this new, school life, learning how to make her own choices, how to follow all the rules, how to recognize who her true friends are, how to deal with occasional bulling situations, and so on. And I have to be here for her, first. But I will try my best to keep up to my Monday-Wednesday_Friday blogging schedule. I hope you are having great start of the new week.Wish you a wonderful day everyone. Hello! Very sweet post about how hectic your days have been and being there for your daughter, with all the changes she is having now! Well, I used to post many times a week in my previous blog (same name), and then I started to post once a week. Since July I started posting twice a week and from next January on I will go back to once a week only - because I need time to do other things that I am postponing. So, just relax, post whenever you can! I loved your purchases - I like L'Occitane very much and products with shea butter. Bad about Nails Inc. :( The color is gorgeous, though. And will be waiting for the reviews you promised - Mask and foundations :) Wishing you a great week! I think I used to post 5 times a week, at the beginning, but you are right, Denise, I better relax and post whenever I can. Sure, the reviews will come soon, I'm so curious about these products because I have never tried anything from Fresh. Wish you a lovely day, dear. nailsinc is really disappointing, especially for the price tag! You are right, pam. If I knew it was so bad quality, I would get 2 Etsie nail polishes for that price, they are better quality. Love what you picked at Sephora! I totally get about thinking you will have more time at that age. Give it a couple more years and you will have some time. Have a terrific week Nina! I hope your daughter settles in kindergarten soon. It looks like you picked some great pieces. I wish we had Sephora here in the UK. I am surprised that Nails Inc polish is bad. I have couple of their nail polishes and all of them are amazing (well, actually all but one). But I guess they maybe changed their formula or something. I got the same birthday present and I still have to try it out. I'm a big fan of Loccitane! So loving their products. Oh, these are gorgeous products I'd like to try myself. Your purchases are lovely.. I know of someone that also complained about the nail polish don't know tho.. Not a fan of makeup. I'm obsessed with the sephora instant nail remover! Doing my nails is so much easier and quicker! Nice stuff indeed. I like it too! It's a shame those nailsinc polishes weren't that good - they're such lovely shades! Bummer about the nail polish! I'm a still a dedicated OPI fan. Such a lovely stuff... sorry for the nail polish! I've always wanted to try the rose face mask! Thanks for this info. So great ! Such great finds my dear! I love l'occitane products and this one looks like a must-have! I love L'occitane! Smell so good! I have all of those too!! Great haul. I absolutely adore Crown Place; what a gorgeous nail shade - so perfect for this festive season!! These are some amazing brands, babe! Heard a lot good things about them. Thanks for sharing! I love a good Sephora haul- new beauty goodies are always fun to try! i have never tried the Sephora Instant Nail Polish Remover! i really would like to ! These look divine! Merry Christmas! I hope your daughter settles in kindergarten soon. My 4 year started kindergarten this past September and everything you described has been the same for me. I know how it is. I love L'occitane products and this one looks great! Ah sales shopping is the best! You have some amazing products there!